Everyone loves Elmo, that cute furry little muppet spokesperson for the pre-school set. But there’s a deep, dark secret behind his adorable visage. 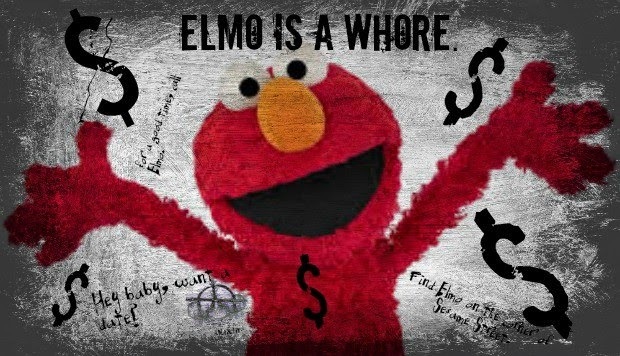 I hate to break it to you, but Elmo is a whore. Harsh, right? Well, prostitution is the act of selling oneself for money. And Elmo is now the cutest little spokesperson around for pro-vaccine propaganda. Watch the following video right from the Sesame Street corner. Keep a barf bag handy. So, back to whoredom. In cases like this, there’s always a money trail. Prostitutes get paid, right? We rely on our funders’ support to bring the Sesame Workshop mission to life. Their collective commitment enables us to harness the educational power of media to benefit children around the world. We gratefully acknowledge the generous support of our current sponsors and partners, without whom our work to educate and inspire children would not be possible. First of all, the Merck company makes many vaccines and stands to make a LOT OF FREAKING MONEY when little kids begin asking their parents to take them in for shots because Elmo said so. And, secondly, the Gates Foundation is long-noted for their pro-vax agenda. They help the starving children in Africa (or Third World location of the week) not by actually feeding them, but by injecting them with toxic vaccinations. Who can forget last year’s fiasco when they actually GAVE nearly 50,000 Indian children polio with their charity vaccines? Read this article about the worldwide path of destruction wrought by the Gates Foundation and their deadly vaccines. Written responses should be addressed to: National Vaccine Program Office, U.S. Department of Health and Human Services, 200 Independence Avenue SW., Room 733G, Washington, DC 20201. Attn: HHS Adult Immunization c/o Rebecca Fish. While the NVP provides a vision for improving protection from vaccine-preventable diseases across the lifespan, vaccination coverage levels among adults are not on track to meet Healthy People 2020 targets. The National Vaccine Advisory Committee and numerous stakeholder groups have emphasized the need for focused attention on adult vaccines and vaccination. That’s what the new Federal Register publication is all about! Apparently, the feds want adults to get as many vaccines as MDs are pumping into children. Parents concerned about their vaccinated children potentially contracting measles from unvaccinated children may want to consider the fact that the bigger health threat is technically the vaccine, not the disease itself. Comparative data provided by the U.S. Centers for Disease Control and Prevention (CDC) and the Vaccine Adverse Event Reporting System (VAERS) reveal that nobody has died from measles in more than 10 years, while at least 108 deaths reported in VAERS during the same time frame have been linked to measles vaccines. Many of our older readers probably remember a time when measles wasn’t viewed with the obscene level of paranoid hysterics being witnessed today. Like chickenpox, measles was a common childhood infection that, after running its typically mild course, imparted lifelong immunity in those who contracted it. The risk of serious complications or death from measles has always been overwhelmingly minimal, in other words, with previous generations viewing it as something of a rite of passage. Fast forward to today and all rationality and common sense has gone out the window on this issue. The media is reporting a few isolated cases of measles as if it were the black plague, calling for those who don’t vaccinate their children to be ostracized from their communities or even jailed for “putting others at unnecessary risk.” But where are the facts in all this unsubstantiated mania, which unfairly tags the unvaccinated as dangerous lepers? Once again, the media is discarding factual reporting in favor of mindless sensationalism, attributing an alleged measles resurgence — even this claim is specious — to the unvaccinated. Whether or not this claim is actually true pales in importance compared to the fact that measles really isn’t much of a threat in the first place. The measles vaccine, on the other hand, is a whole different story. “There have been no measles deaths reported in the U.S. since 2003,” the Associate Press reported based off statements made by Dr. Anne Schuchat, director of the CDC’s National Center for Immunization and Respiratory Diseases. Meanwhile, VAERS, which captures only a very small percentage of the actual number of injuries and deaths associated with measles vaccines, reports at least 108 deaths associated with measles vaccines since 2003. Of these, a shocking 96 deaths were reported in conjunction with MMR, which is now the preferred vaccine for measles immunization. Every time there is a pandemic, whether its the flu or Ebola, companies like Glaxo, Sanofi-Aventis, Merck & Co, Novartis AG and Pfizer Inc do everything in their power to convince you that you are the pandemic and that the shot is the remedy. Please share this video and message. This video is a compilation of research and updated information proving the vaccine agenda is what is behind the Ebola scare. For full interview and other IMPORTANT links, click “Show more”. Actor and comedian Rob Schneider recently sent a letter to California Governor Jerry Brown’s office. It is posted at canaryparty.org. Within it, he claims to possess the smoking gun which would expose the entire vaccine-autism CDC fraud in suppressed documents. “The IOM also recently conducted a thorough review of the current medical and scientific evidence on vaccines and certain health events that may be observed after vaccination. It released a report in August 2011 on 8 vaccines given to children and adults that found the vaccines to be generally safe and serious adverse events following these vaccinations to be rare. – Understanding the frequency and trends of autism spectrum disorders. – Advancing research in the search for causes and effective treatments. Schneider points out many important fallacies with the CDC’s claim, though not specifically mentioning the fact that comprehensive research has never been conducted on the outcomes of the current vaccine schedules forced upon our children. The Ebola Vaccine is here. Consult your doctor and get vaccinated today!